Look, I'm in an actual photo! 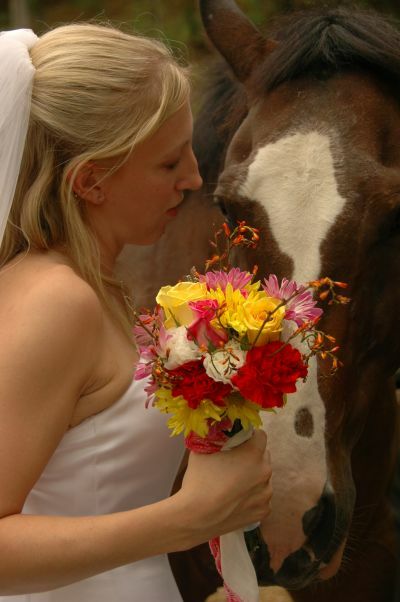 And yes there was a horse at my wedding. I fell off of a horse once. Honestly I actually didn’t “fall” I think more accurately I was more so flung into the air. You’d have to ask my friend who had the bright idea of teaching me to ride WITHOUT using the stirrups, I was too busy trying not to die to see what exactly happened. And even more honestly it was all the fault of the brilliant wanna-be-cowboy who thought it would be a genius idea to jump onto my horse (a trained western rodeo, used to be a bucking bronco type of horse) from the round-pen fence while we were cantering. After I was done playing with the tracers and laughing about the small dent in my helmet I rushed over to my horse, and with shaky knees got right back on. It wasn’t so easy to get back on the horse that chased me down in a field with a whole famous western scene stallion rearing up with the sunset behind him. Yeah. His name was Freckles. He should be glue. Fear. Pure fear, that’s how I stayed on, and friggen thighs of steel. You fall off you get back on. The fear may not disappear but you get back on, unless the horse’s name is Lucy or Freckles, then you just stay the hell away, but normally you get back on. So what do you do when your brain, your conscience, your self-esteem is the big scary horse that threw you into a brick wall? You brush the horse poop bad thoughts off of you, take a picture of the dent in your helmet laugh off the hurt, tighten the reins and dig your feet securely into the stirrups. You Get Back On. Even if you have to ask for a boost from a friend. Even if you need a shot of liquid courage first. Even if it requires an entire bottle of Advil. And yes I might be repeating a theme from the last post. Deal with it. It is THAT important. I still don’t think or believe that I have the talent for this whole “writing” deal. I still think my book should have a date with my goat’s stomach, but I’ve never been the type to let anything get the best of me, even if it’s a horse that’s 5 billion times bigger than me or a dog that sent me to the er after he thought my flesh would make a tasty snack. How scary could a little book be? Certainly no scarier than a hoof to the hip, or a 70 pound Belgian Malinois with a grudge. Shakey knees, butterfly filled stomach, and a billion pounds of doubt and all, I am getting back on. This entry was posted in random rambles, Resolutions, writing and tagged falling off a horse, fears, getting back on, writing. Bookmark the permalink. It’s so funny, to me, to read how you “doubt this whole writing thing”. I’ve said the same thing about myself…except, g’friend…you DO have talent. You, like me, compare yourself to the already published – the lucky few who’ve worked really hard (and maybe one or two that haven’t…worked hard) to get their words into the hands of an appreciative reader. I wonder: Do they question every phrase they type? Do they question their talent, skill, marketability? Oh…I’m 100% positive that so many, many, oodles of them do. The difference between The Talent that gets published and The Talent that languishes in “I Wish I Would Have…” is that they love writing so much that it finds any way it can to seep out of them. You KNOW you see yourself in that last statement. So, question answered…whether you asked or not…KEEP WRITING AND WORKING ON THAT DAMN BOOK, WOMAN! As for me…I was bitten by a horse once. One should never walk up next to a horse while they are eating. Stupid kid.